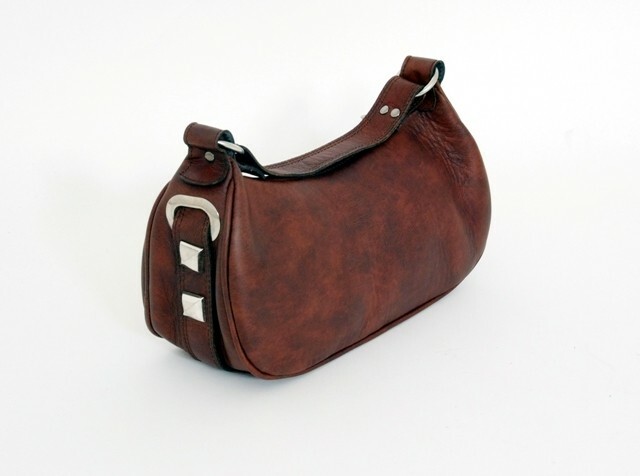 Burgundy brown leather handbag with side stud detail. Designed by Carmen Poveda, Spanish Leather, quality certificate included. Burgundy brown leather handbag with side stud detail.30.5cm/12" wide, 15.5cm/6" long,short handle/strap 25.5cm/10" long, 69cm/27" removable strap included, beige lining, inside zip pocket, zip close 23cm/9" long, solid base.